← So, why drive oldschool? Now a normal sane person would either persevere and try and sleep, or go on Facebook or Youtube to pass the time a bit. Given how awake I am, I reckon I will be awake for another two to three hours. I am also not a normal person. So I get up, dress and go out. Each time I go out, I am usually greeted with the same Germanic face, my car. I get in, turn my car on (and wake up the neighbours in the process), engage first and just drive. When I just go for a drive at night, I never plan out where I am going. Will I go left or right? Will I go into town or in the country-side? That is the first great thing with driving at night, there are no limits. Going into town does not mean having to sit in traffic all the time, the city is empty, everyone is asleep. Driving in the country-side means being immersed in total darkness and silence. It is scary and impressive at the same time. No tractors or lorries here, just you and nature. When people drive at night in the country-side however, it becomes less about relaxing. When in the country, it becomes all about the communication between man and machine. Driving fast during the day is, let’s be honest, stupid. There are so many users on the road that it makes every single car a potential accident. At night, you remove that parameter. You are now alone, in the dark. The best thing to do is, like me; get a car with not very powerful headlights. That way you have a natural barrier that limits your speed. Trust me, when you can only see fifty metres in front of you, you do not want to drive fast! However, you still do get to enjoy the ride! During the day, you listen to the radio, talk to you passengers, or wonder about another problem. At night, you have none of these (if you turn off the radio that is!). You communicate with the car feel its limits, what it’s telling you. Now is the time when you search for that perfect shift, that optimum line in that corner, or the best oil temperature at which to really push it. At night, everyone feels like a racing driver. Because of that limited visibility, it is at night that you feel more alive. Your body is conscious about the looming dangers ahead you cannot see, and because it is scared, the adrenaline pumps in. Sadly, that is why there are so many accidents at that time. Because of the limited visibility, some bright people think its good time to try and go faster, even though they cannot see anything. You have to know you and your car’s limits. That’s the typical view people tend to have about night driving, a crazy loner speeding through the country, soon to be featured on the front page of the local paper, in the big steel carcass his car once was. In the city however, it is a totally different story. 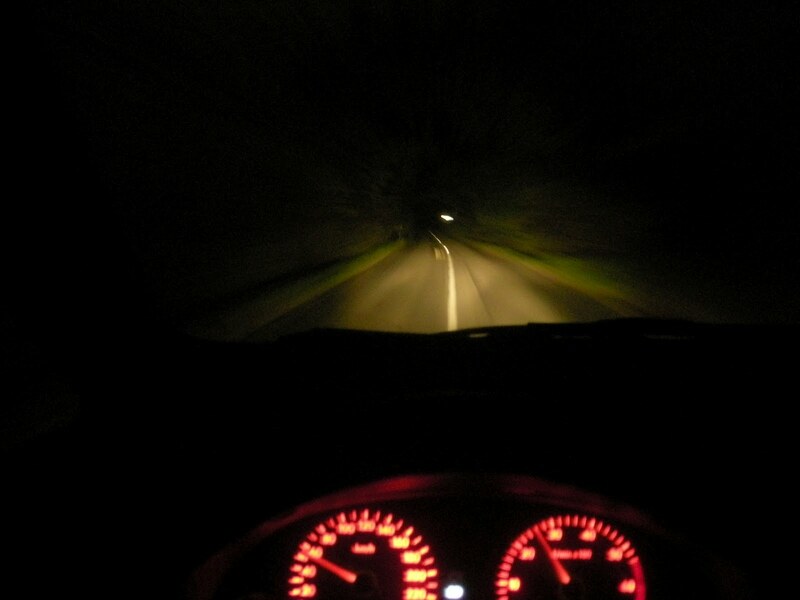 When you go for a drive at night, you are alone with no pressure or things to do. You simply do what you want to do, go where you want to go. It is one of those rare times where you feel you have time and freedom. This is more so the case when driving in town at night. It is a big paradox really; one pictures cities as places where everything moves fast, nothing stops. Yet at night everything does stop. When the last party-goer is in bed, silence creeps in. The city is now yours. In my mind, cities look their best at night. That is the time where you get to truly appreciate their inner beauty. The lighting schemes are usually very cool, giving the city a new depth. It is no longer black on white, but white on black, which is very soothing on the eye and somehow enhances your other senses. Think about the night scenes in the movie, “Drive” with Ryan Gosling. The lone driver, in his car, at night. Cool wasn’t it? It may have been dark (the movie), but violence aside, the city became part of the movie, not just a simple background. Moreover, the streets may still be lit, but that feeling of being alone in such a big place is a relaxing one. The fact that you are in your car further enhances that feeling. You are in your own metal shell, like a crab (as famously put by Jeremy Clarkson). You are no longer burdened with work or deadlines. You can now spend your time. You can think, reflect or plan. It has been claimed that meditation can be achieved by focusing on a single task for a period of time, in silence, so the rest of the mind can relax. When you drive at night in the city, this is exactly what you do. One is looking to find inner peace. So there you go then, driving at night, not only can you feel truly alive, but it can also help you relax. And in today’s fast paced world, that is one folly we could all use. This entry was posted in Philosophy of driving and tagged city, country, drive, night, philosophy, pleasure, road, therapy. Bookmark the permalink. 3 Responses to Driving at night: Therapy or folly? I also do this. Boring people will never understand. I would rather drive my car around all night than go out to a bar or club.